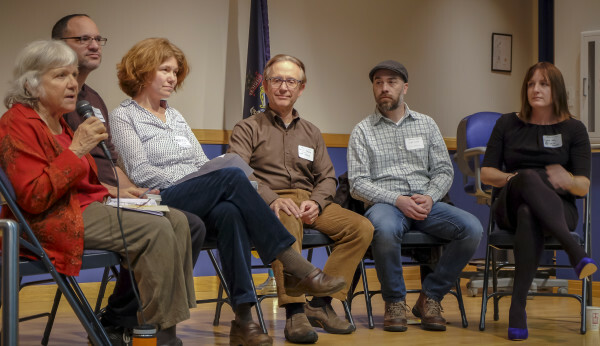 Some of the panelists who spoke on Thursday, Nov. 10 at the Slow Money Maine gathering in Belfast were (from left) Bonnie Rukin, the coordinator of Slow Money Maine; Dan Fireside of Equal Exchange; Marada Cook of Crown O'Maine Organic Cooperative; Francis Boero; Scott Cooper, the director of finance at Crown O'Maine; and Lynne Hoey of San Francisco-based RSF Social Finance. BELFAST, Maine — The North Vassalboro-based Crown O’Maine Organic Cooperative has a problem. But don’t worry — it’s the kind of problem a lot of businesses would like to have. The family-run and employee-owned food distribution cooperative has more than doubled its sales in the last five years, from about $1 million annually in 2011 to about $2.5 million a year now. Still, Marada Cook, the general manager and the daughter of co-op founder Jim Cook, who passed away in 2008, said last week that they cannot rest on their laurels. But Crown O’Maine doesn’t want to grow just to make more money, Cook explained. She wants the business to scale up so that it can provide its employees with health insurance and a wage that truly is enough to live on “with dignity.” Her finance director told her that to meet these goals they needed to hit the $10 million figure. Now, Cook and the others at the company have to figure out how to grow fast without losing what makes them special, including values such as advocacy of small family farms, fair pricing and a viable regional food system. “How do businesses find that sweet spot?” Cook asked during the session she helped lead. Another presenter, Daniel Fireside of Equal Exchange, based in West Bridgewater, Massachusetts, shared some ways that his for-profit, worker-owned cooperative which distributes fairly traded goods such as coffee, chocolate, tea and bananas works to find its own sweet spot. Equal Exchange was founded in 1986 by three friends who had a big dream and little money, but who nonetheless were able to drum up $100,000 to start the new company which aimed to do good in the world. By 2015, the company generated nearly $65 million in sales and had more than 140 worker-owners. Fireside said that Equal Exchange has worked to innovate ways that companies with a strong social mission can still secure financing. But at Equal Exchange, the founders decided to limit the amount of money that could be gained by selling the company. If it is ever sold, all profits must be donated to another, similar organization. “There’s no incentive to sell,” he said. Equal Exchange’s unusual model meant that in the early days, it was hard to find enough investors to do expensive things like pay coffee farmers for a year’s worth of crop in advance. But after years of steady, if modest, returns, the company has more than enough interested investors now, Fireside said. Cook said that she is committed to making her cooperative thrive even on a larger scale. Correction: An earlier online version of this article gave an incorrect founding date for Equal Exchange. The company was founded in 1986.